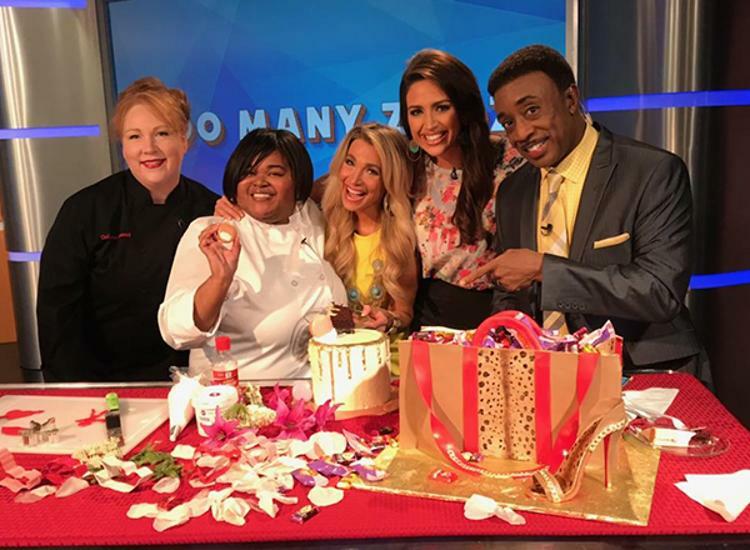 (From left) Tri-C culinary arts professor Maureen Leonard; Tri-C graduate Shant'e Dunton; and Fox 8 Morning Show hosts Stefani Schaefer, Kristi Capel and Wayne Dawson gather for a group photo during the taping of Wednesday morning's Fox 8 Recipe Box segment. Cuyahoga Community College culinary arts professor Maureen Leonard and recent program graduate Shant’e Dunton were back in front of the camera Wednesday morning, returning to the Fox 8 Morning Show Recipe Box to demonstrate how to make another baked creation. Leonard and Dunton appeared on the Morning Show this past October with a recipe for Halloween finger cookies. This time, the pair focused on Dunton’s specialty: cakes – specifically, chocolate cake with raspberry filling and vanilla buttercream frosting. You can find the segment, and the recipe, at the Fox 8 Cleveland website. Dunton, a December 2017 graduate of the Tri-C Culinary Arts Program, runs her own cake business out of her Cleveland home. Simply Cakes by Shant’e produces custom cakes for a long list of clients, some as far away as the East Coast. Dunton’s business, and her Tri-C experience, were documented in one of the College’s fall 2017 graduate success stories.